A new The Incredibles 2 special look will make its debut during the PyeongChang Winter Olympics 2018 on Wednesday, February 14th. The Incredibles popped up in a new TV spot where the characters are watching the Olympics on TV, which ends with an announcement that a special look will premiere during Winter Olympics on Valentine's Day. This is huge news since all we've seen is the initial teaser trailer that was released back in December of last year. In addition to the new TV spot, posters for the Incredibles 2 have been popping up around New York for Fashion Week. Disney and Pixar are ramping up the promotion for the Incredibles 2 with some awesome new Olympics commercials. Though most of the commercials are comprised of exclusive footage made just for the Winter Olympics, there are shots from the new movie that hits theaters this summer. 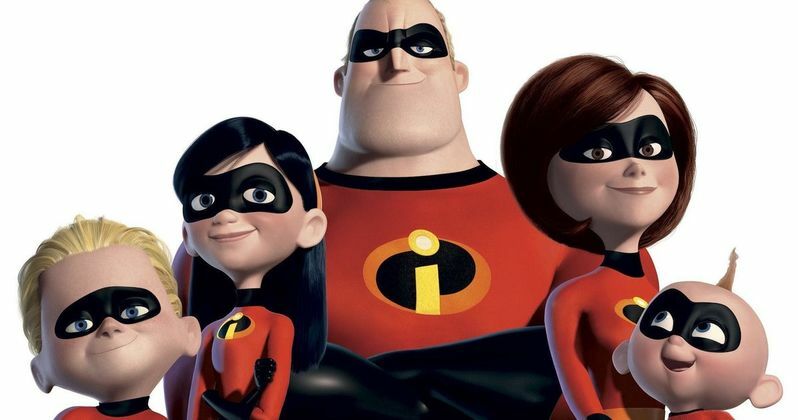 We're treated to some brief clips of the Parr family participating in Olympic events spliced in with brief clips of the movie including Elastigirl (Holly Hunter) truly living up to her name while Samuel L. Jackson's Frozone is seen skating around a bus. Additionally, Disney and Pixar unveiled new Incredibles 2 posters in New York for Fashion Week featuring Craig T. Nelson's Mr. Incredible getting some of the wrinkles out of his costume on the ironing board, which also hints at a possible stay-at-home dad for the character since Holly Hunter's Elastigirl will be more of the focus this time around. The other new poster for the Incredibles 2 is close up shot of Brad Bird's Edna "E" Mode with a caption that reads, "It's been too long, dahlings." The Pixar Twitter account tapped into Mode's love of fashion for Fashion Week, even though she thinks that models are "spoiled, stupid little stick figures with poofy lips who think only about themselves." Back in January, Disney and Pixar utilized a spoof of Google's Arts and Culture app to promote Incredibles 2, matching the voice actors to their respective characters. The humorous promotion tapped into the trending app at the time while showing off which actors look the most like their animated counterparts. In case you were wondering, Bob Odenkirk and his Winston Deaver character were the highest match at 78 percent with Huckleberry "Huck" Milner's Dash coming in a close second at 71 percent. It isn't clear what the special look will show us about Incredibles 2, but fans are hoping for an extended trailer comprised of the tiny new clips that we've been treated to. However, we could get a behind-the-scenes featurette as well, though a proper trailer seems like a safe bet since we've already been treated to some new clips throughout the 2018 PyeongChang Olympic Games. For fans looking for more Incredibles 2, be sure to be watching the Olympics on NBC on Wednesday, February 14th. You can check out the Olympic TV spots for the Incredibles 2 below, thanks to Red Robot King 7's YouTube channel.